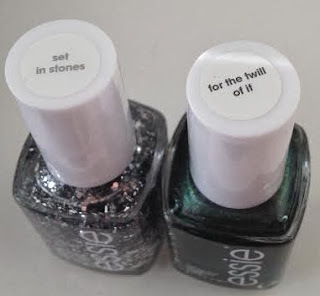 I really am all about Essie Set in Stones at the moment. The flecks of silver glitter are of different sizes and this creates an amazing splatter effect. Plus a real bonus is that it doesn't feel gritty on your nails. 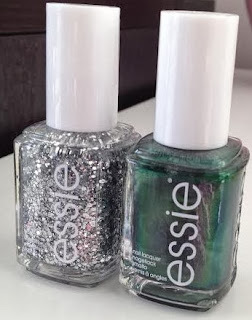 Last week I created a Christmas Nails look by layering it over a red polish (see here). 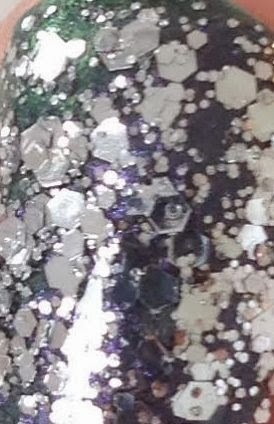 This week I was curious to see how many layers of glitter would be needed for a really opaque effect - just like a glitter bauble. After a clear base coat I created a base layer using Essie For the Twill of It. This is a beautiful duochrome polish which changes with the light. It is a dark grey but with hints of blue, green and mauve - it reminds me of oil catching the light. It only took one coat to be fully opaque and the brush made application really easy as it was wide and slightly curved. Over the top of Essie For the Twill of It I started to layer up the Set in Stones glitter. In the end I went for 4 coats until it was pretty dense. 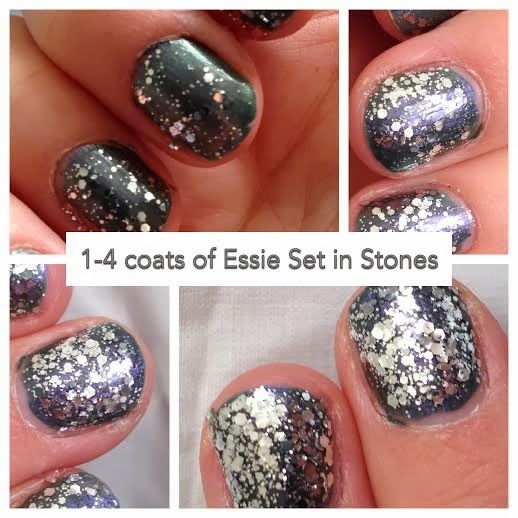 Finally I slapped on a coat of my trusty of Sally Hansen Insta-Dry to set it and I was done. I'm really pleased with the finished result it is exactly the silver bauble effect I was hoping for. Using a darker base coat really brings out the glitter. I may need a chisel to get it all off though. What do you think? Any tips for the best way to remove glitter polish...?